Description: It's a bird, it's a train, it's...........?????? Description: VERY SLOW DAY IN THE TEHACHIPIS TODAY. I STOOD OUT HERE JUST OUTSIDE OF BAKERSFIELD FOR HOURS AND ONLY CAUGHT 2 FREIGHTS. Description: With a new crew for the train in the background, another pig train cools its heals as it nears 35th Ave. Title: BNSF 5368 slowing to a crawl in order to let the rear helpers return to connellsville. 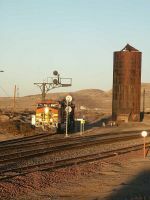 Description: BNSF 5368 grinds up the west slope of Soldier Summit at West Gilluly, UT. Description: BNSF 5368 eases its consist down the steep grade through Kyune, UT. A pity there is not more overhead traffic on this route since the closure of Tennessee Pass, yet the BNSF trackage rights business adds a little. Description: BNSF 5368 is almost to the summit at West Solider Summit, UT. Description: BNSF Willow Springs, IL to Alliance, TX intermodal train Z-WSPALT8-23A sails through Justin - BNSF Fort Worth Subdivision - BNSF 4136, BNSF 5368, BNSF 5525, 26 loads (11 lines), 0 empties, 2006 tons, 2654 feet, ETD BNQ 43339. Title: Anybody want some horsepower???? Title: CSX K689 makes a rare day time apperance with a BNSF duo! Description: K689 passing CP26 with two BNSF pumpkins! 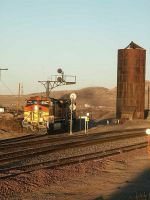 Description: For the time I have railfanned and lived in Postville, IA. I have never seen BNSF come thru town until today!